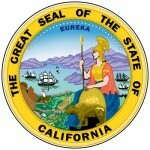 The California Articles of Incorporation of a Nonprofit Religious Corporation| ARTS-RE should be filed with the California Secretary of State to satisfy requirements placed on new entities of this type in the State of California. This type of entity will require contacting the Internal Revenue Service and the California Franchise Tax Board. That is, merely filing the Articles of Incorporation may fulfill some state requirements but it does not satisfy all of them. It will be up to the Incorporators forming this corporation to up to date on Federal and State mandates that will hold jurisdiction over the entity they are forming and make sure that entity is in full compliance with all such mandates. There will also be some follow up paperwork which must be taken care of. After filing these articles, the Incorporator will have ninety days to file a Statement of Information (SI-100). The articles should be filed once they have been completed, verified, and signed by the Incorporators. They must be filed with payment for the filing fee and any required provisions or supporting paperwork attached. This must be accompanied by a payment for the filing fee of $30.00. You may file these documents by mailing the documents and payment to “Secretary of State Business Entities, P.O. Box 944260 Sacramento, CA 94244-2600″ or in person at “Secretary of State 1500 11th Street, 3rd Floor Sacramento, CA 95814″ however, it should be noted that an service charge of $15.00 will be assessed if filing in person. 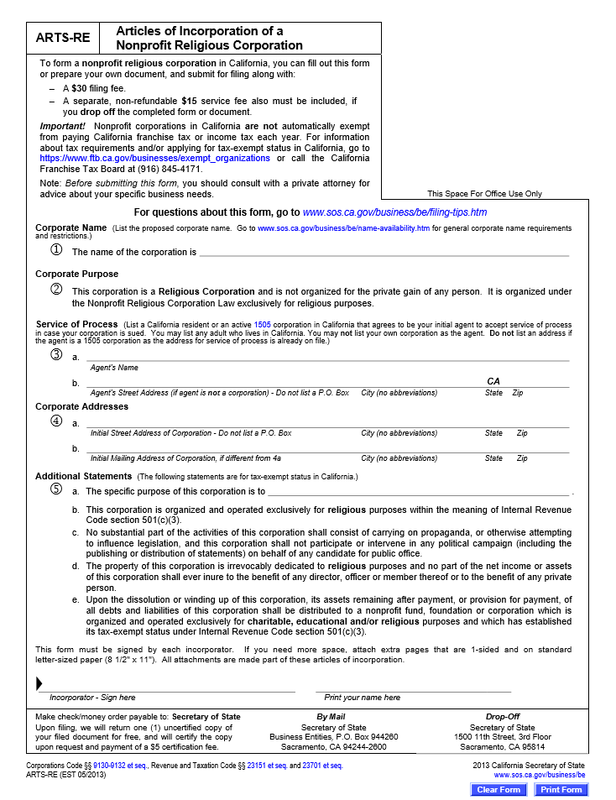 Step 1 - You must define the name of the Religious Corporation being formed in California on the blank space in Item 1, under the heading “Corporate Name.” This must be a unique name in the State of California. If the name is found to be currently used, this application will be denied. Step 2 - Read the second item, or “Corporate Purpose.” The corporation being formed must adhere to all the statements this section contains and marries this form to all state laws applicable to religious corporations within California. Step 3 - You must name the registered appointed corporate agent here who will receive court documents and notices (for lawsuits if the corporation is sued) on behalf of the forming entity. List the name of this party in Item 3a and, if previously unregistered, the address of this party in line 3b. Step 4 - Next, under the heading “Corporate Addresses,” document the Physical Street Address of the religious corporation in Item 4a then the Mailing Address (if different) in Item 4b. Note: Do Not List a P.O. Box in Item 4a. Step 5 - In Item 5a, document the specific purpose of the religious corporation being formed. The remaining items (5b-5e) should be read and thoroughly understood. Step 6 - All Incorporators must sign and print their names to this document. If there is not enough room at the bottom then continue the signatures and names on a separate sheet of paper and attach to the articles you have just completed. In either case, you will receive a copy of the articles you have submitted. You have this returned as a certified copy should you request it and pay an additional $5.00 certification fee.